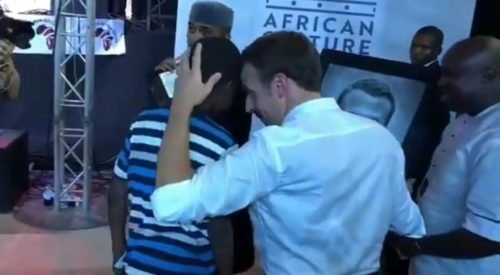 Master Kareem Olamilekan, 11, artistically drew a portrait of President Emmanuel Macron of France during his visit to the New Afrikan Shrine in Lagos. The event held to showcase and celebrate African culture was hosted by Nigerian Artist and performer Banky W and Kenturah King. @EmmanuelMacron “Very touched, congratulations to this young boy. Despite the pressure of drawing the President of France on the spot, Kareem completed the hyperrealist drawing In 2 hours, reports suggest. The visiting President emphasised the importance of the shrine to the African culture. “The Shrine is an iconic cultural hub. And I say with a lot of humility that I recognize the importance of African culture. 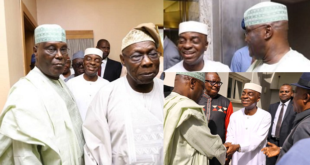 Also present at the event were Nigerian Senator Ben Murray-Bruce, Nobel laureate Wole Soyinka and Veteran Nollywood actor and actress Olu Jacobs and Joke Silva. The New Afrika Shrine is the venue of the annual Felebration Music Festival which is currently managed by Femi Kuti and Yeni Anikulapo-Kuti. He Deserves Worldwide Recognition!!! 👑👑👑 Talented 11year Old Nigerian Boy Kareem Warris Kassim Draws President Of France Emmanuel Macron In Just 2hours Live At The Afrikan Shrine In Lagos Btw Giveaway For Most Active Commenters Is Still On!!! The Afrika Shrine celebrated the legacy of the music legend, Fela Anikulapo-Kuti, on Tuesday as it hosted the President of France, Emmanuel Macron.